SUM is fortunate to have three handbell choirs. We play five octaves Malmark Handbells and supplement with handchimes. Anyone interested in joining one of the handbell ensembles should contact our Music Director, Bridget Scarlato. The Chancel Ringers meet every Thursday evening and play at least once per month in Sunday worship services. This group is composed of adult ringers who can read music. 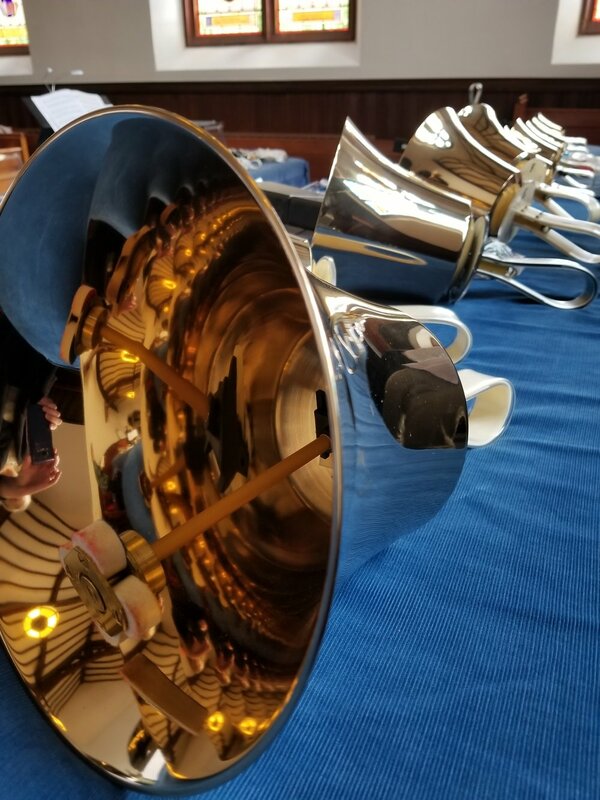 Members of this group participate regularly in area handbell conferences, like the Connecticut Spring Ring and the Area 1 Festival Conference, and are actively involved in outreach performances in the community. The Insigni Ringers are primarily teens (with some adults, as well). This group is our more advanced group for youth ringers, and they play for special services throughout the year. The Wesley Ringers is designed for beginning ringers, both children and adults. While Chancel and Insigni Ringers play at Levels 2-4, Wesley Ringers play at a Level 1 and through weekly rehearsals learn basic handbell techniques. This group plays approximately once every other month in Sunday services, and participates in other special events both in the greater community and in the life of the church.